MANILA, Philippines — Gone are the days where you'd need a "fixer" to help you with passport-related concerns. Times have definitely changed. Just recently, the Philippine Department of Foreign Affairs (DFA) opened a new consular office in Megamall. Passport applications and renewals are now practically stress-free. The new DFA (NCR East) branch is in Megamall, Building C, 7th floor. Just so it's done, I had my passport renewed the other day even if it still expires next July. 1. Visit DFA Passport Appointment System here. It's clear, thorough, and straight to the point! 2. Check out "What to Expect" and "Documentary Requirements" so you're in-the-know. 3. Set appointment venue, date, time. Usually the next open schedule is in 2-3 weeks. 4. Print on long bond paper the application form that's e-mailed to you. Leave it unsigned! 5. Prepare valid ID/s and support documents (with photocopy). No need to bring ID picture. I opted for Megamall because I saw DFA's billboard every time I rode the MRT. I scheduled a 10am appointment, the earliest schedule, hoping that I'd be the only one there. When I arrived at 8:45am (talk about being excited), there were already 20 people in line by the bus bay. We were forced to wait outside because Megamall was still closed. Early birds. There were already 20 people waiting in line at 8:45am for the 10am appointment. Since Megamall was still closed, we all had to wait outside. Just because I was bored in line. Waiting patiently for the elevator to bring us up to the 7th floor. Avoid the 10am appointment! This way, you won't end up waiting outside, sweaty, and smelling the bus' fumes. Perhaps a 10:30am or 11am schedule would be better so that the mall is open already. From Building A's top floor, there's a connection near Bruno's Barbers leading to DFA in Building C.
Those who had 10am appointments were prioritized. An officer will look at your unsigned application form. Once verified, proceed to getting a number. Wait for your number to flash on screen. Once called, an officer will request for your application form and passport (including a photocopy of front and back pages). He may or may not request for your valid support documents. Too bad the officer didn't look at mine. I even brought my college yearbook! Still, it's best to be prepared. After signing the application form, expiring passport will be hole-punched and returned to you. Just in case you forgot to photocopy or get something notarized, you can have it done at the back! Pay for your passport renewal. For regular processing (15 working days), cost is Php 950. For Express Processing (7 working days), it's Php 1,200. It's awkward how payments are done at Window #17 while receipts are claimed at Window #16. To improve the flow of "traffic", my unsolicited advice would be to interchange the the two windows. After all, people are coming from Processing, which is nearest to Window #16. Do not lose your receipt! Your photo will be taken here. Smize and give your best Mona Lisa smile! If you feel that you look hideous in the photo, ask nicely for a retake. Hope that your officer is nice! Remember, earrings aren't allowed in the photo. Eyebrows and ears can't be covered, too. Here, your number will not be called. You'll be asked by the guard to sit in line. It's reminiscent of the old government queuing system where people move from one seat to the next until it's their turn. Officers even have to shout their window number to signal that they're open. This cheapens the experience. Why can't customers get a new number? Facilities are there, anyway. The guard will ask you to sit in line. This requires you to move from seat to seat until it's your turn. It's interesting how some officers wore face masks. Perhaps to prevent spreading their cold? Good thing this officer had a mirror on her table! Was able to fix myself before my photo was taken. Choose whether you'll have your passport picked up or delivered. For delivery, the cost is Php 120. I opted to have it delivered for convenience. My new passport is expected to come on Dec. 13 or 14. Overall, the process was quite efficient and professional. It didn't seem third-world. This is how government services should be like. If DFA can do it, I'm sure the other government offices can, too. Now go ahead. Delete your "fixer's" number already! Oo nga. Maybe they had technical difficulties that day. All the facilities naman were there, e. Hehe! And oo! Super nakakatuwa ang bagong system ng DFA :) Sana talaga ganyan ka-efficient yung ibang gov't offices. Yung releasing ba on time din? Yup, it's generally on time naman. My officemates got theirs on the date specified. Mine came a day late--though there's a warning naman that it be a day or two delayed. If I'm not mistaken, I don't think that walk-ins are accepted in these satellite branches. You really have to go online and book an appointment. The guards check for the print-out/confirmation that you are scheduled for an appointment on that time and date. Thanks! Confirmed appointment is required for all applicants except senior citizens, infants and minors below 1 year old, person with disability and OFWs. For OFWs, sufficient proof must be submitted such as a valid employment contract or OEC. --so, no appointment required for senior citizens. can a senior citizen renew a passport even without appointment? or even prior to her appointment date? Hello! I'm sorry for the late reply. If I'm not mistaken, there's a senior lane in the satellite offices. However, seniors will still need to set and confirm an appointment date. Oh wow! I didn't know that. Thanks for this info! Will be useful for my parents! :) Hehe. Hello! Sorry for the late reply. Oo, mabuhay! :) Hehe. yes i agree,na paka hospitable nila.. laging naka smile.. mula sa guard hanggang sa loob. I didn't really notice the guards pero napansin ko mejo haggard sila nung umaga dahil unang batch kami. Hehe. But yeah. The officers are nice! The lady who took my photo even let me borrow her mirror. At nagpa-retake pa ako ng tatlong beses. Hehe. Pde ba mga new applicants dito or renewals lang to gaya ng satelitte office ng LTO? If I'm not mistaken, pwede po ang mga new passport applications sa satellite offices. hi! do you know what is the email address they give to inquire if you can already pick up your passport? As far as I know, you can apply for a new passport in Megamall :) Don't forget to schedule an appointment! Every PSK there will be some schedule at what time the database will be open for passport appointment booking. E.g. for PSK Kolkata it is 3 PM every day. You cannot try before that. Otherwise you will get a message same in the screen. Now if try from 3 PM time and able to view the next screen, then you can see the available slots. Simply you can click on a slot and further proceed for booking. But the thing is not so easy. As many people try at the same time, so the database responds to them only who has a high speed or 3G internet. For a general internet speed you might reach to that screen, but by the time you click and book a slot, some will finish the booking itself. So practically there is no such tricks to book online passport appointment. But we have couple of choices or alternatives to get an appointment. Let's check them and try to find out whether they are useful or not. First thing you can do is to take high speed internet connection. If you don't have that or you cannot replace your existing one then find out among your friends. It will be a just 5 min task. Always keep trying to log in before 5 min of actual time. Keep trying, although you will get the massage. Because everyone will do the same. If you are able to manage a slot, then in the next screen you have to fill up the captcha or verification letters. Don't be in hurry, fill it up very carefully. Remember if you miss a single word, then you will not get a chance to come back again. You have to try next day. Thank you so much for sharing this info. You have helped me with this. Last Saturday, April 27, I accompanied my father for the renewal of his passport at DFA-Megamall. He is a senior citizen. Were able to complete the process in less than an hour including courier service. I'm glad this was able to help you. :) You're right--sana lahat nga ng gov't services ganito ka-efficient. By the way, how true is it that senior citizens can just walk in without an appointment? 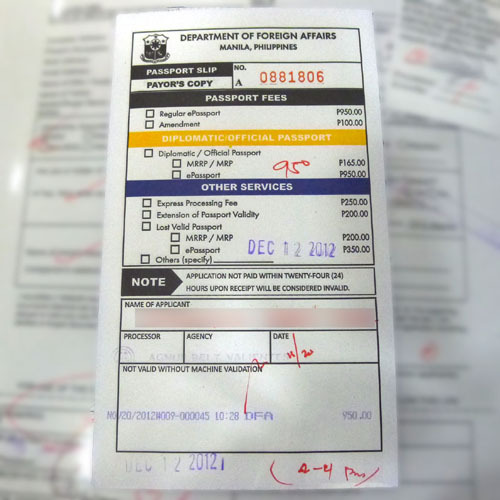 Do OFW's needed also an appointment for passport renewal? Honestly, I'm not too sure. Maybe! Though you may want to call DFA to confirm. From one person who commented above, there is a senior citizen line. Not sure if there's a need to schedule an appointment, though. Hi, ask q lang, kxe pnpabalik nlng aq, dhel my prob lng ngkonti sa birthcert ko, pwede ba khet saturday bumalik? Open ba cla? I don't think it's open on Saturdays. Though might be best to double check, just in case I'm wrong. Sayang naman. I am just wondering if in the 15 working days, are saturdays included? can i wait inside the mall? or iba ung entrance ng dfa pag sa loob? member kasi ako ng gym so allowed na ako pumasok as early as 7am. If that's the case, yup! Just wait it out sa gym. Besides, you're only allowed to enter if it's your appointment time na. kailangan pa po ba magpa appointment kahit senior citizen na? Per our one of the comments above, no need for senior citizens to book appointments. Though Im not too sure how this will go. Hello po gd am,ofw po kc hubby ko mgrerenew n sya ng passport according sa dfa pde n po walang appointment, tanong ko lng po wat po b best time mgpunta sa robinson ok lng po ung 3 pm para mgrenew? Sa tingin ko pwede na bilang hindi ka na minor. Though best pa rin to double check with DFA mismo. hi.. ask ko lang.. kung 1:30 and appointment ko. what time kaya ako dapat nandu.. Thanks for sharing Mr. Boy Wander! It's a big help for first timers like me, especially the photos you take! awesome! ah 1200 at ksma p courier 120.. sbi 7 working days kpg special.. but 15 days na wla p dn ang aking passport this mrch nid ko n urgent ang passport ko.. then tumtwag ako s hotline puro pasa gngwa nila prng awa nio na.. wag nmn gnito..kawawa mga iba png nangyyri ng gnito hndi lng ako.. asikasuhin nio nmn po kmi.. ang laki ng binayad nmin.ngyon kung ssbhn nmin n regular irerefund nmin ayaw nio..unfor sming mga custmer d nio alm ang hirap mghagilap ng 1200.. ng absent p ko pra mahinty yng delivery n yan.. prng awa nio na kung hndi nio maayos to mg papaimbestigador ako.. kwawa kapwa pilipino.. pinagpapasahan nio lng kmi..
January 5, ag aplay ako ng passport hanggang ngaun ala pa kelangan ba dumaan pa dun s courier? Kahit nakapag bayad na ako sa cashier ng 1200? anu na bang update sa status ng aking passport realeasing pa dapat ito nung july 14 -20 2015 kaso hindi pa daw dumadating ang delivery ng mga passport dahil daw sa printing error ng mga machine kaya hindi ko pa nakukuha ang passport ko magiisang buwan na pero hanggang ngayon wala pa rin akong malinaw na nakukuhang sagot sa dfa kung kelan ang exact na release ng aking passport tuwing mageemail naman ako sa binigay nilang email address laging reply ng email sakin maghintay daw ako dahil chinecheck pa daw sa bangko central ang mga passport at prinaprioritize na daw pero bakit wala pa ring nangyayari laging sinasabing antayin ang upadate pero hindi naman na ulit nageemail sa dfa megamall ako nagprocess na aking passport express ang process na aking pinagawa dahil sa kailangan ko na makakuha ng aking passaporte kaya sana ay marelease na ito maging priority niyo sana ang email ko na ito. para saan pa ang regular at express na prosesso kung ganito din naman ang mangyayari . Aasahan ko na sana magreply kayo sa email ko at bigyan niyo ito ng kaukulang pansin at karapat dapat na aksyonan agad. Hello Arnie, As far as I know, hindi po pwede iyon. Baka pwede lang for Senior Citizens? Thanks! Hindi po kayo hiningan ng id while processing or encoding? Hindi na because i think the documents/old passport on hand during the verification stages were enough. hello po para lang po ba sa renewal ng passport ang DFA NCR East Megamall? Pwede din po ba ito sa mga new applicant? Hi tanong ko lang po para lang po ba sa renewal ng passport ang DFA NCR East megamall? Pwede din po kaya sa new applicant? Hello! May I ask if need po ba receipt ng NSO birth certificate? I lang ID an hinihingi for first time applicant. Thank you.